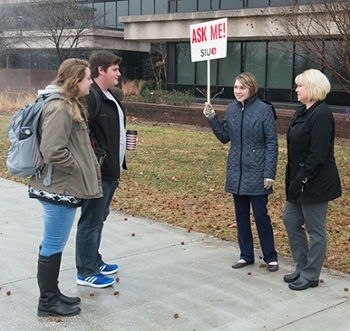 Volunteers were spread throughout campus displaying “Ask Me!” signs and offering guidance. Others greeted students and hosted the third annual hot chocolate stand. Photo: (L-R) Junior computer management and information systems major Shauna Yeager and sophomore biology major Nathan Smith talk to Ask Me! volunteers Stephanie Stookey and Kirsten Huene from Human Resources during the first day of the spring 2018 semester. 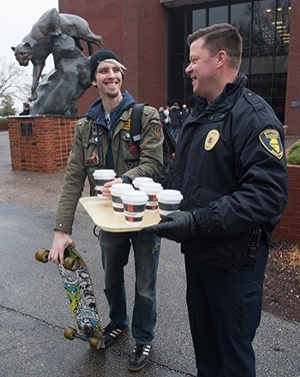 Senior computer science major Matthew Michaels accepts a hot chocolate during the first day of classes from SIUE Police Chief Kevin Schmoll.